Marketing challenges > New BBC Website: The Future Of Web Design? New BBC Website: The Future Of Web Design? The BBC has announced the launch of the long-awaited redesign of its news website. This is a change that will affect millions of people in the UK and abroad. From the screenshots we have seen so far, the relaunch will feature a fresh new design; a change the BBC is boasting is the biggest since 2002. Here at dotAgency, we are fascinated by this move as it’s really interesting to see which bits of cutting edge web design the Beeb will incorporate into the new site. – Top navigation – the navigation bar which used to sit on the left hand vertical has been moved to the top horizontal. This should allow more flexible room below for better spaced content, larger images and more video, providing an all-round richer user experience. – Secondary menu – a secondary menu has also been added to the main navigation similar to that found on the The Guardian and The Independent sites. This gives more prominence to the navigation of ‘Video and audio’, ‘Magazine’ and ‘In Pictures’, which were previously further down the page. It also generally demonstrates the increasing importance of richer multimedia content. – Most Popular and Top Stories – as more and more of us visit articles directly through social media recommendation (as opposed to navigating through the homepage), the increased prominence of the ‘Most Popular’ and ‘Top Stories’ links on the new site will help capture visitors’ attention and entice them to read other articles. – Home – the link back to the main homepage has been renamed ‘Home’, whereas before it was ‘News Front Page’. This indicates that users prefer more understandable conventions. It would be interesting to know whether the BBC tested this change. – Header – When the BBC recently rolled out changes to its main website, they made the point of incorporating a consistent header throughout. 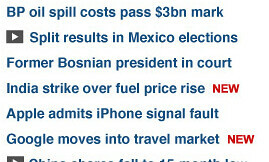 So it’s interesting to see that the new BBC News site is significantly different again. Does this mean the consistent header wasn’t working for them? Or maybe they will eventually roll out the new header across all the rest of the site? – Video – there is a far greater importance given to video on the site, indicating a move to please the ‘YouTube generation’ who now demand a richer experience as we spend less time in front of the TV and more time on the internet. – Pictures – content such as ‘In Pictures’ has been organised into ‘categories’, ‘location’ and ‘time’; another trend from social networks that visitors will be familiar with. – iPlayer – there is clearly a lot more cross-promotion of the BBC iPlayer service, another move that points towards more video on the site and the increasing popularity of IPTV. – Social network sharing – social networking links are more prominent to encourage sharing of content. However, instead of a range of bookmarklets, now only Twitter and Facebook links are present. This could indicate that Delicious, Digg, Reddit and StumbleUpon, which used to be present, are on their way out, while Facebook and Twitter are gradually gaining critical mass. – Social bookmarking – these links now appear at the top and bottom of pages to provide greater visibility, underlining the fact that this is a very important trend for the BBC. – New – although there is nothing new about visitors wanting access to the latest stories, freshly added content will now be marked on the site with a ‘New’ badge. With the increasing ‘real-time’ nature of the web, this suggests that site visitors want quicker and more immediate access to content as we all spend less time consuming individual articles due to the sheer quantity of news now available online. – Spacing of content – better spacing and organisation of content will allow users to quickly and easily scan and pick-up on articles they are interested in. – Space – the header area now spans the width of the browser and appears less boxy. This could be a sign that content is being opened up to provide a richer experience on a range of different devices and screen sizes. 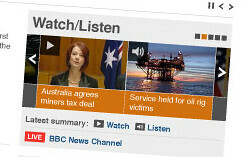 – Less Web 2.0 – the new, more polished graphics show much less of a ‘web 2.0’ feel compared to the main BBC homepage. Is this a sign that the web 2.0 look is a dying trend, at least in terms of design? – Headings – larger headings are a continuing trend generally in web design, but they also help users to quickly identify and pick out content they are interested in. Change is always tough! Some people will love the new site, others will hate it, but these are always snap judgements and it’s only over time that we’ll really learn whether the new site is a winner or not. It will be interesting to find out from the BBC more about its beta testing process. Did the web team split-test the old and new site? Did they run focus groups or did they take a user centred approach with user testing sessions? Will they be continuing to make changes based on how the site is used when it finally goes live? It doesn’t look as though this will be the last change the BBC makes in the near future either. The revelation that it has a ‘homepage team’ suggests more developments are afoot and also that the homepage remains one of the most strategically important areas of the site. However, other pages throughout the site are undergoing significant changes, suggesting they too have increased importance. The only thing I can be certain of is that the website design agency team here at dotAgency will be keeping a close eye on what happens. As website designers, we like to stay at the forefront of these trends and not only incorporate great new styles from elsewhere into the work we do, but even try out some new things ourselves. 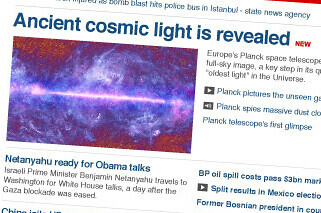 One day, you never know, our ideas might even make it onto a future iteration of the BBC website! We’d love to know your thoughts. What do you think of the new site? Is it an improvement? Let us know in the comments or get in touch with us on Twitter.